1- Brandon Weeden, QB, Oklahoma State: Weeden is a bit of a polarizing prospect but I like him. He had a pretty good week and while he isn’t NFL ready as some quarterbacks are I do think he warrants serious 3rd round consideration and some 2nd round consideration. I think he will end up in round two, but I’m not sure I would personally pick him that high. That said, even if he sits for a year or maybe two he would be 30 or 31 when he stepped into the starting line-up. That would give him a solid shot at 6-8 years of starting at the QB position. That’s not a lot of upside, but if he’s ready to play when he is inserted into the line-up I think he could help his team win games as much more than a game manager. He’s not an ideal Andrew Luck type prospect because of his age, but I think he could be ready after one year of learning on the bench. 2- Russell Wilson, QB, Wisconsin: Wilson was my #2 quarterback coming into the week and he remains there after watching him this week in practice. His height hurts him, we all know that, but he made a terrific point in an interview I read from him where he said that there are very few quarterbacks that are tall enough to just see over the offensive line. Most guys have to move in the pocket to find throwing lanes, and that’s something he can do. With his over the top release, strong arm, quick release and mobility I don’t think he will have a problem in the NFL despite measuring in at 5’10” 5/8. He’s got plenty of arm talent and more importantly has fantastic intangibles. Give him a year or two on the bench and I think he can be a quality NFL quarterback. 3- Kirk Cousins, QB, Michigan State: Cousins moves up to #3 for me after this week because I think he was pretty consistent. He doesn’t have a rocket arm, and he isn’t great in the face of pressure, but he’s got some upside and may be able to develop into a solid starter with a couple of years on the bench. I don’t think I would draft him as my quarterback of the future, but he could be someone with a Matt Moore type of career with maybe a little more of a shot at starting. 4- Ryan Lindley, QB, San Diego State: Lindley is still a guy I like even though he showed his typical inconsistency this week. His accuracy needs work but I think with a couple years on the bench learning from a NFL starting quarterback Lindley would have time to improve his mechanics and footwork which could help some of his accuracy issues. I’m probably in the minority on him, especially when it comes to ranking him over Nick Foles, but I like Lindley’s arm and long term development potential. 5- Nick Foles, QB, Arizona: Foles is a bit of a polarizing prospect himself. He’s got quality tools thanks to his size, natural arm strength and he’s got some accuracy, but I just don’t see a 1st or 2nd round pick when I watch him. He hangs onto the ball for a long time and just doesn’t look good with pressure in his face. He’s got potential, I won’t deny that, and I’ve heard good things about his football IQ this week, but I’m still not sold on Foles. 1- Doug Martin, RB, Boise State: Doug Martin, or the “Muscle Hampster” as he is sometimes referred to, came into the week as my top back here and that has not changed. He’s a complete back that can run the ball between the tackles, catch the ball out of the backfield and pick up pressure in pass protection. He’s ready to start in the NFL right now and while I don’t think he will be a 1st round draft pick I definitely think he should go in the 2nd round which is where I have graded him for a long time now. 2- Chris Polk, RB, Washington: Some people here were dogging Chris Polk this week but I just didn’t see it. Maybe he didn’t look like he had as much burst as some thought he did, but he is more of a powerful back than a guy that has great change of direction speed and burst. He’s still got a NFL future ahead of him though because of his ability to run the ball and catch passes out of the backfield, though he needs work on pass protection like many running backs do when they leave the college ranks. 3- Isaiah Pead, RB, Cincinnati: Pead demonstrated the ability that I thought he would this week. He’s a complementary back, not a feature back, but he’s more than talented enough to offer you the versatility to make plays running the ball, catching the ball out of the backfield and maybe even on special teams. I’m not sure he’s got a NFL future as a punt returner, but perhaps he will as a kick returner. Regardless, Pead offers some upside as a 3rd round pick and I think he’s got a solid shot to go in that range. 4- Vick Ballard, RB, Mississippi State: Ballard came into the week #4 on my rankings and he stayed there after this week. I’m not sure he’s a guy that will go in the top 100 picks, or maybe even in the first four rounds, but I think he will be able to stick on a NFL roster and work his way into a contributing role early in his career. He still doesn’t look great catching the ball out of the backfield, but if he wants to improve that I think he will be able to. 5- Chris Rainey, RB, Florida: Rainey has been telling people all week that he’s going to run a 4.1 in the 40 yard dash. I’m not sure I believe that, but I do expect him to get into the 4.3’s and you can see his speed when he lines up at running back and at receiver. He lined up a lot at receiver this week, probably more than he would have liked, but being able to run the ball out of the backfield and be split out to run routes will only help his stock. He’s an explosive guy that should help whatever team drafts him stretch the field vertically and horizontally on offense, plus he offers value as a return man. 1- Bradie Ewing, FB, Wisconsin: Bradie Ewing was the best fullback coming into this week and after Chad Diehl went down with a concussion earlier this week he was really the only one left standing. He’s got draftable ability at fullback and I think he will end up being a NFL starter. 1- TJ Graham, WR, North Carolina State: Graham definitely helped himself this week, perhaps more than any receiver here. His speed is extremely evident and he looks like he will be running in the 4.3’s in the 40 yard dash, but he also caught the ball well, created separation with his route running, and overall looked like one of the more impressive receivers here. I really liked him as a sleeper and he looked terrific in his final game at NC State, but between that and this week of productive practices he should be on everyone’s radar by now. He’s a guy that I might have a 3rd round grade on once I finish my film study on him. 2- Joe Adams, WR, Arkansas: Adams was impressive this week, but I still have some reservations about him. His hands and concentration aren’t always what you want them to be, but he’s as explosive as anyone here in Mobile this week. He’s got plenty of upside as a slot receiver and as a return man, but if he can improve his hands and concentration issues he could be an extremely dangerous player at the next level. 3- Marvin Jones, WR, California: Marvin Jones came into the week under the radar and I personally had a 5th or 6th round grade on him, but he definitely helped himself this week. I’ve seen him drop some passes on film, but his hands were consistent this week and he looked like a possible 4th rounder this week. I’ll have to go back and study him further, but he definitely has draftable ability and should be a nice #4 receiver early on in his career. 4- Gerell Robinson, WR, Arizona State: Gerell Robinson is a player I’ve seen a lot of this year because I spent a lot of time watching Brock Osweiler. He’s got upside as a receiver thanks to his size and length, plus his hands have become more reliable as the season has gone on. He came into the season as a possible undrafted free agent and now he may not make it into the 5th round, especially after a positive week this week. 5- Juron Criner, WR, Arizona: Criner’s hands were never in question, and he showed that this week, but I worry about his ability to separate at the next level. But if you can catch the ball you can stick in the NFL, so while he may not be an early pick I think he can stick on a roster. His route running wasn’t very impressive this week, but if he can get coached up for a year or two as a route runner I think he could clean up some of his sloppy footwork in his breaks. That might allow him to create more separation and be a more consistently productive receiver. Even if he never runs great routes he has shown the ability to make tough catches in traffic, so while I don’t think he has great upside as a receiver I do think he has upside and draftable ability. 1- Michael Egnew, TE, Missouri: Egnew came into the week as my top tight end and that hasn’t changed either. He’s got everything you could want in a tight end because of his size, length, athleticism and hands. He’s still got room to improve as a blocker, but his value is as a receiver without a doubt. 2- Ladarius Green, TE, Louisiana Lafayette: Green definitely showed his athleticism and potential this week. He’s not going to be ready to walk into the NFL and start I don’t think, but he’s got a lot of upside as a developmental prospect at the next level. He’s got the frame to fill out more after weighing in at 237 this week, he’s got impressive size, length and hands. He’s not a finished product, so his upside is very intriguing. 3- Deangelo Peterson, TE, LSU: Peterson is a bit underrated because LSU didn’t throw the ball consistently well while he was there. He’s got the size and athletic ability to offer some upside, but I don’t think he will get drafted very high because of his film. He’s a tough guy to project because there’s not a lot of film on him, but he has upside. 4- Brad Smelley, TE, Alabama: Smelley is a late round guy that can stick on a roster and contribute on special teams and add depth to the TE position. I’m not sure he will ever be a NFL starter, but may be able to work himself into a #2 role at some point. 5- Brian Linthicum, TE, Michigan State: Linthicum is in a similar boat to Smelley. He’s not a guy who’s got a lot of upside but I think he might be able to work himself into a #2 role at some point. He was hurt at one point during this week, I’m not sure with what, but he’s not a guy that I see being a NFL starter. 1- Mike Adams, OT, Ohio State: Adams took control day one and never really let it up in my opinion. He showed the ability to play left tackle from the get-go which impressed me. I don’t think he has the versatility to play on the right side though because he needs to get stronger in the lower body to anchor better versus bull rushes. He won’t be much of a run blocker in a man blocking scheme, but if he can pass protect at a pretty high level he should be worth a 1st round selection come April. 2- Cordy Glenn, OT, Georgia: Cordy Glenn has plenty of upside when it comes to the NFL Draft. I think he could play both guard spots, right tackle and even left tackle in a pinch. He’s got pretty good athleticism for such a large man, though he does bend at the waist at times. He’s got plenty of potential as an offensive lineman, and pending my film study of him I think he’s got a 2nd round grade right now. 3- Jeff Allen, OT, Illinois: Allen came into the week pretty underrated but he definitely opened some eyes this week as he was able to succeed at offensive tackle and at guard in practice. I think he’s a left tackle in the NFL, but showing the versatility to play inside at guard will only help him when it comes to the NFL Draft. He’s a quality pass protector and I feel that in a zone scheme he could be an effective run blocker as well. He’s not going to get a great push in a man blocking scheme I don’t think, but if he can pass protect effectively he could find his way into the 2nd round come April. Left tackles always move up and get drafted earlier than you’d think, so don’t be surprised if Allen goes higher than most expect. 4- Zebrie Sanders, OT, Florida State: Sanders came into this week as one of my top offensive tackles and he definitely hurt himself this week. He has the athleticism and length to play left tackle in the NFL but he’s a year away from being a starter there. He’s got upside, but he needs to get much stronger in the lower body and it concerns me that he was not finishing blocks for the entire week this week. He was able to get into position and block effectively at times, but he didn’t finish the block and that’s concerning. If he doesn’t finish blocks in the NFL then he will give up effort sacks to guys with good motors. 5- Mitchell Schwartz, OT, California: Schwartz helped himself this week. He looked solid in pass protection, has an anchor to recover, and projects to the right side in the NFL. I don’t think he’s much more than a 4th or 5th rounder (I came into the week thinking he was more of a 5th or 6th rounder), but he’s got the potential to be a back-up RT for a year or two and then compete for a starting job if he progresses well. 1- Kevin Zeitler, OG, Wisconsin: Zeitler came into the week as my top offensive guard here and that didn’t change. Was he perfect this week? No, definitely not. He showed some issues with speed off the ball and wasn’t perfect in pass protection either. But he’s definitely a 2nd round guard and may have pro-bowl potential down the line. 2- Kelechi Osemele, OG, Iowa State: Osemele has plenty of upside thanks to his great size, strength and length. However, he lumbers when he moves and struggles to re-direct and change directions quickly thanks to his massive size. I think he can be a good run blocker in a man blocking scheme but he will struggle if asked to pull or block in open space. I don’t think he has the potential to play right tackle after seeing him this week, and he definitely looked better inside at guard. 3- Senio Kelemete, OG, Washington: Kelemete caught my eye thanks to his impressive first step, athleticism and he has some pop with his initial contact. However, he needs to get stronger to help him anchor versus bull rushes and to help create more of a push in the running game. He’s a great fit for a zone blocking scheme right now in my opinion, but if he wants to hold up better against bigger, stronger interior linemen then he needs to get stronger. When he doesn’t beat you initially off the ball to get position then he struggles to win 1 on 1 match-ups. 4- Tony Bergstrom, OG, Utah: Bergstrom looked like he might be able to stay outside at tackle early in the week but I think he might be better inside. I think he has the potential to play outside, but I think he might be better on the interior. 1- Michael Brewster, C, Ohio State: Brewster didn’t have a great week in my opinion but he didn’t look bad. He’s a 2nd or 3rd round Center in my opinion that can have a long career as a starter. I don’t think he’s an elite player at the position, but he’s smart and should be comfortable starting for a long time. I don’t think he’s going to make a good offensive line great, but I think he will be a reliable player at the position for a long time. 2- Philip Blake, C, Baylor: Blake has shown the ability to play guard and center this week, and I think he’s going to go higher than many might think. He’s got an impressive anchor, he’s got pretty good length and I think he can be a NFL starter at center or guard after a year on the bench. He’s got the strength and girth you like at the point of attack for both positions, and might have slightly more upside than Brewster does at the position thanks to his size. 3- Ben Jones, C, Georgia: Jones looked like an average athlete this week and I have a 3rd or 4th round grade on him right now. He struggled to anchor this week and looks like a guy who could be a NFL starting center but I don’t think he’s going to be a good or great player at that position. 4- William Vlachos, C, Alabama: Vlachos is one of the most strangely proportioned human beings I’ve ever seen. He’s a short, squatty player with very short arms and just doesn’t look like a NFL player when you look at him from a pure measureables standpoint. He’s a fighter though and he has pretty good technique and plays with good leverage thanks in part to his lack of height, so he might end up being a starter at some point. He’s a 5th or 6th round pick in my opinion, but he might be able to have a long NFL career thanks to his football IQ and quality technique. Thanks for reading! Defense coming soon. -Brandon Weeden, QB, Oklahoma State: Weeden is my top quarterback because he has what the scouts are looking for in terms of size and arm strength. It will be interesting to see how he does with a batch of new receivers, but I like him as a prospect. Do I think he’s a 1st rounder? No, but I think he may end up in the 2nd round or at least the 3rd round barring a very problematic week for him here. His age will limit his stock, and it will definitely make him a polarizing candidate because I believe he will need a year of development before he can have significant success as a starter (meaning he would be about 30 years old by the time he was a starter). He’s got potential though and should have 6-8 years of quality quarterbacking in him if he is developed correctly, and that’s more than enough to spend a 2nd or 3rd round pick on if you need a quarterback. -Russell Wilson, QB, Wisconsin: I am high on Russell Wilson, I’ll say it right now. Is he the prototypical quarterback? No, I don’t think he is. He’s going to measure in at 5’11” if not slightly under that in my opinion, and that will turn off a lot of scouts and a lot of draftniks if I had to guess. But I’ve watched this kid a lot over the last two years and I am convinced that he absolutely has a NFL arm and more than that I am convinced that he has a NFL head on his shoulders. There probably weren’t 10 quarterbacks in the entire nation this year that could have come into a completely foreign situation in Wisconsin and do anything like he did this season. Again, that’s my opinion, but I think people tend to forget just how skeptical some were before the season that he would be successful as a starter for the Badgers. I am really hoping I will be able to interview Russell to get a sense for his personality and his intellect on a one on one level, but I refuse to write him off because of his height. Plenty of people will, but I think that is a mistake. I wouldn’t bet against this kid based on what I know about him. -Ryan Lindley, QB, San Diego State: I like Lindley and I think he has a chance to really impress this week. I was disappointed I didn’t get to see him at the East-West Shrine Game this week, but I am glad he has a chance to show what he can do on an even bigger stage. He has a live arm and NFL size, but his accuracy has been an issue and he can be a little erratic at times based on the tape I’ve seen of him. This week will be big for him, and while I think he will show his faults I think he will demonstrate his upside as well. He might not be this high on others’ rankings coming into the week, but hopefully he has a strong enough week to turn some heads. -Kirk Cousins, QB, Michigan State: Cousins is a player that people have slept on his entire career. He’s never been big enough or fast enough or talented enough to be the outright favorite, but he has fought through it and been successful despite that. I think that speaks to some intangibles on his part, and I think he has a toughness and gutsiness to him that isn’t especially easy to find in a quarterback. However, his lack of arm strength will be a limitation at the next level and he isn’t especially poised in the face of pressure in the pocket. That doesn’t project him to be a great starter at the next level, but I think he has a long NFL career ahead of him as a back-up and a possible spot-starter. -Nick Foles, QB, Arizona: Foles is an interesting player to me. He has the physical tools to be a NFL quarterback, but I am just not a fan. There’s obviously a lot more to playing quarterback than just your physical ability and God-given tools, but I don’t know much about Foles other than what I’ve been able to see on tape. I am not high on his intangibles at this point and haven’t been overly impressed with him in the 4th quarter when I have watched him. He has a chance to change my mind this week and I have to study a lot more of his 2011 tape, but at this point I think he is an overrated prospect as a possible 1st or 2nd round pick. The 3rd or 4th round range would be more realistic because at that point you are talking about a bit of a project and at least a year or two of development, but coming into the season I had a late round grade on him. -Kellen Moore, QB, Boise State: This isn’t meant to be a slight against Moore, but when you’re a shorter player teams are ready to write you off as a potential starter anyways, but his lack of arm strength makes it even easier. He’s got average arm strength to be fair, but his ball velocity is lacking on throws beyond 10 or 15 yards. Measuring in at 6’0” or taller is critical for his draft stock, as silly as that might sound, because unlike Russell Wilson he doesn’t have the arm strength to make up for his lack of size. He’s got the intangibles and the smarts to be a NFL quarterback based on what I have seen on film and been able to find out about him, but being smart with limited size and arm strength doesn’t exactly qualify you to be a NFL starter. It means he will stick in the NFL, which I expect him to do, but it will be in a back-up role for the most part in my opinion. -Doug Martin, RB, Boise State: I love Doug Martin. I think people mentioning him as a possible 1st rounder are a little ambitious only because the demand for RB’s usually drives running backs down in the draft not up. Martin is absolutely a complete back though and he reminds me a bit of Ray Rice (I have to credit one of my Twitter followers for making the comparison to Rice before I did). He’s going to be a productive NFL back barring injury, and I expect him to demonstrate all of his ability throughout the week. I’m excited to see him in person. -Chris Polk, RB, Washignton: Polk is a guy that has been underrated for about two years up until a couple of months ago. A lot of people felt comfortable saying that Jake Locker had “zero” talent around him at Washington. He may not have a had an abundance of talent around him, but Polk is a very legitimate 2nd or 3rd round running back prospect and he really helped make Locker’s life easier and he certainly helped Keith Price out in his first season as a starter this year. He’s the 1B to Martin’s 1A in my book, so I expect him to have a good week as well. -Isiah Pead, RB, Cincinnati: Pead doesn’t strike me as an every down/feature back in the NFL but I definitely think he can contribute to an offense. He’s more of a complementary back in my opinion but he has impressive burst and speed as well as pretty good hands out of the backfield. I haven’t seen him much in pass protection, but he definitely warrants 3rd round pick conversation at the RB position. Again, I don’t see feature back potential from him but he could be a helluva complementary guy if used correctly. -Vick Ballard, RB, Mississippi State: Ballard is a solid back who runs with good power and is a bit underrated at this point. Is he a top back? Not in my opinion, but I don’t think there’s much doubt he has the potential to contribute at the next level. I’m not sure if he is a guy who can be the feature back at this point, but he should show the ability to carry the ball effectively early on his career. -Chris Rainey, RB, Florida: Rainey is a speed demon that has not shown the ability to consistently run through tackles and gain yards after contact. His value is in the open field and when he can find some space to run and really show off his great burst and speed. He’s not a feature back in my opinion, but he has plenty of upside as a complementary back, as a receiver out of the backfield (or possibly split out) and as a return man. He should show that off this week. -Bradie Ewing, FB, Wisconsin: Ewing was the starting fullback in Wisconsin’s run heavy offense and definitely has enough blocking ability to contribute in the NFL. Fullback isn’t a position with a ton of demand though, so I don’t know where his stock is at this point. He should have a strong week blocking, but I’m not sure he’s a very good receiver out of the backfield. -Dwight Jones, WR, North Carolina: This receiver class looked extremely deep a few days ago, but after the Senior Bowl lost Michael Floyd, Nick Toon and now Kendall Wright three of the top five receivers who were supposed to be here won’t be. That means that, almost by default Dwight Jones moves up and I think he has 2nd/3rd round potential, which might make him the #1 receiver here. He’s got a lot of upside thanks to his size and athleticism but his hands are too inconsistent for my liking. Some have him in round 1, but I don’t like him enough for that. -DeVier Posey, WR Ohio State: Posey has a lot to gain this week. He’s got NFL size and athleticism to be sure. His hands were always incredibly inconsistent at Ohio State and he figures to have a number of drops this week, but if he has the work ethic to improve his hands a bit he could really shoot up boards. He may do it anyways considering where his stock might be after serving a nearly year-long suspension. -Jeff Fuller, WR, Texas A&M: Fuller hurt his stock this year as he fell from a possible 1st or 2nd rounder to a 3rd or 4th rounder as of right now. He looked slow this year and that hurt his stock considerably, but if he can show better speed and consistent route running this week he could really breathe some life into his stock. I have a feeling he will look faster than most are expecting him to, so I think he could definitely help himself if he shows up with his A game this week. -Marquis Maze, WR, Alabama: Maze is an underrated receiver in my opinion and I anticipate him turning some heads this week. He’s a bit undersized and the weigh-in will be important for him, but I think he has the hands and route running ability to create separation and stick in the NFL as a slot receiver. -Joe Adams, WR, Arkansas: Joe Adams is a tricky player for me to project. He’s so explosive thanks to his fantastic speed and burst, and once he gets the ball in his hands he is so fun to watch because of his combination of balance, strength and physicality. He’s undersized but he doesn’t play like it, and that’s always fun to watch. But I’m not sold on him as a route runner and he has had drop issues in the past, he just doesn’t have great hands. It will be interesting to see what he weighs in at, but more than that I will be interested to see how well he catches the ball away from his body this week. He’s had trouble with that when I’ve watched him on film. -Brian Quick, WR, Appalachian State: Quick is a guy I haven’t had a chance to see play yet and I’m very excited to get that chance this week. He’s got impressive size and should have a positive experience at the weigh-in, but I honestly can’t say too much about him as a prospect at this point. I’ll definitely be keeping an eye on him this week. -T.J. Graham, WR, North Carolina State: T.J. Graham is a guy that really caught my eye as a sleeper after I saw him play in NC State’s bowl game. He had a huge game, but he was productive this season, has great speed and flashed the ability to run through arm tackles despite his size. He’s a good receiver and a good return man, and if he has a consistent week catching the ball and running routes I think he will definitely start to open some eyes and move up draft boards. -Juron Criner, WR, Arizona: Criner is a player that a lot of people were high on coming into the year but his draft stock really dropped over the course of the season. He’s not the best receiver in the draft by any means, but he is still draftable and has some value as a prospect. I’m very anxious to see him going up against some quality competition at corner this week. -Gerell Robinson, WR, Arizona State: Robinson is a nice addition to this game and he easily had the best season of his career as a senior this year with Brock Osweiler throwing him the ball. Robinson is the definition of a possession receiver and consistently came up with big catches over the middle or on curl routes to extend drives for Arizona State this year. I like that about him, but I question his speed and I’m not 100% sold on his route running either. He’s got upside and value though, and considering he was a possible (or maybe even probable) undrafted free agent before the season started he has really helped his draft stock this year. -Marvin McNutt, WR, Iowa: I like McNutt but from what I’ve heard he is dropping on draft boards around the league, and it’s not super tough to see why. He’s solid in all aspects, but doesn’t do anything spectacularly well. Not only that, but he showed a lack of speed and physicality this year and that has to concern scouts. He’s a late round pick right now as far as I can tell, so this week is huge for him because he may be able to breathe a little life into his stock if he plays well. But if he doesn’t he might drive himself close to the 7th round/undrafted free agent conversation. I hope that doesn’t happen, but I can’t rule it out if he struggles. -Michael Egnew, TE, Missouri: I really like Egnew and he is definitely the top tight end here in my opinion. He’s got great size and he has drawn comparisons to Jimmy Graham which I think are fairly legitimate due to their combination of size, athleticism and potential, but Egnew is obviously more polished as a receiver than Graham was when he came out. Egnew doesn’t have much experience blocking though which might hold him back at times this week, but if he is drafted in the 2nd or 3rd round range whatever team picks him will end up being very happy with him once he gets to camp. -Ladarius Green, TE, Louisiana Lafayette: Green is a talented tight end that looks very skinny on film and due to his athleticism honestly looks a little like a very tall, skinny receiver when you watch him. I haven’t seen much from him as a blocker at all, so this week could expose that for him a little bit, but he’s a natural receiver with significant upside. He should be in the 3rd round conversation this year, and I think that is very deserving. -Deangelo Peterson, TE, LSU: Peterson is someone I thought could really improve his stock as a sleeper this season but thanks to Jordan Jefferson and LSU’s pathetic excuse for a passing game that never materialized. He’s got the size and athleticism as well as solid hands to be a productive receiving tight end but he never really got a chance to at LSU. This week could be HUGE for him for that exact reason because he will finally be able to show what he can do when he is consistently involved during this week of practices. -Brad Smelley, TE, Alabama: Smelley is a fun guy to watch because he doesn’t look like he’d be a very good tight end but he makes plays despite that. He might offer more as a blocker than any of the three players I have mentioned previously, and he’s one of those glue guys that I think every roster needs. He’s not flashy, but he’s versatile and strikes me as a hard-working guy that will find a way to stick on a NFL roster whether he is drafted in the late rounds or not. -Brian Linthicum, TE, Michigan State: Linthicum’s value is as a blocker and I’m not sure he has starting tight end upside in the NFL. I just don’t see the route running and athleticism to threaten down the seam, and the tight end position has increasingly become an integral part of the passing game. Think about it: A significant number of teams that ended up making the playoffs this year had an impressive target at tight end, and even though he might be underrated Jake Ballard has been huge for the Giants this year and we don’t need to talk about how good Gronkowski and Hernandez are for the Patriots. Linthicum should get drafted late, but I don’t think it will be for his receiving ability. -Zebrie Sanders, OT, Florida State: I am high on Sanders and I have been since he was a junior. When I was scouting Christian Ponder I openly wondered if he had what it took to slide to left tackle but didn’t think he’d ever get a chance to show it in college. Little did I know that Datko would get injured and Sanders would take full advantage by doing a good job as E.J. Manuel’s blind-side protector. He’s improved his stock a lot this year and with one more good week he could lock himself up as a 1st rounder, and I expect that to happen. -Kevin Zeitler, OG, Wisconsin: Zeitler has been underrated for over a year and he is finally starting to get the love that he deserves as a guard. I think he might be the top offensive guard prospect even though he’s not a behemoth like Osemele or Cordy Glenn. He’s very fundamentally sound and has starting experience in a great rushing attack at Wisconsin. He should be a riser this week and should end up in the 2nd/3rd round range come draft day. He has a 10-12 year career as a starting guard ahead of him, and will be a good value in that range. -Kelechi Osemele, OG, Iowa State: Osemele is a guy I really like. He is dominant once he gets his hands on you and I love watching that type of play from offensive linemen. He’s extremely large and strong, but he won’t be able to stick at left tackle in my opinion. It will be interesting to see if he gets a shot to play right tackle at all this week because I think he has a chance to stick there in the NFL, but even if he doesn’t look good there I think he will be a high draft pick as a guard. -Mike Adams, OT, Ohio State: Adams is one of the well-known participants in Ohio State’s tattoo scandal from this past season but he is a legitimate pro prospect at offensive tackle. I’m not sure I love him at either tackle position because I think he struggles with speed a little too much to stick at left tackle at the next level but he’s not exactly a force in the running game either and might struggle to get a good enough push to be a quality run-blocking right tackle. Regardless, he clearly has talent and should impress at the weigh-in as long as he is in shape. He’s got upside and should be an early 2nd round pick, but may sneak into the late 1st round if there is a team that really needs a tackle picking late. -Cordy Glenn, OG, Georgia: Glenn could try and stick at right tackle much like Osemele this week but I don’t know if that his ideal fit. He’s tough for me to project right now, but he should be fine inside at guard. He’s a HUGE guy but he worries me with his waist bending and isn’t nearly as dominant in the run game as his size would make you think he would be. This week will be big for him because he will need to show up in shape and hopefully ease some concerns that I and others have about him. -Jeff Allen, OT, Illinois: Jeff Allen is an underrated offensive tackle prospect that I am really glad got an invitation to this game. Every time I’ve watched him he has looked solid and I can’t recall a time off the top of my head that I saw him get beat badly. Obviously that isn’t exact, but my point is that Allen looked good consistently this year for the Illini and warranted an East-West Shrine Game invite but apparently didn’t get one, so I’m glad he is here. He can play left tackle in the NFL in my opinion and guys with that ability don’t stay under the radar for too long, so I don’t expect Allen to last long under the radar this week and he could end up being the talk of the Senior Bowl if he plays like I think he could. -Mike Brewster, C, Ohio State: I’m actually not a big fan of Brewster, but I think he warrants consideration in the 3rd or 4th round. He has a chance to show me something this week though. But at this point I wouldn’t pick him in the 2nd round, I just don’t see top center ability from him despite his starting experience at an elite program at Ohio State. -Ben Jones, C, Georgia: I’m not hugely high on Ben Jones either, but I think I like him a bit more than I like Brewster right now. It will be interesting to compare and contrast the two this week because I think Brewster is the better athlete, but Jones has always impressed me a bit more when I watch Georgia. Sorry for the long wait! The defense is on the way! Analysis: A lot of people might have Jeffrey here, but Blackmon is the most dominant receiver in the country in my opinion. I can’t wait to see him play this season because I was blown away by his performance all season long last year. If he has a season in the same zip code as his off the charts performance a year ago then he should be a lock for the top 10 unless he murders Commissioner Goodell on live television. Analysis: Jeffrey is a very physically imposing receiver and he is the definition of a possession receiver. His size alone is enough to get him to the NFL along with his terrific hands. He attacks jump balls and uses his body very well to shield smaller defenders from the ball. He has been the go-to guy for the Gamecocks since he arrived on campus and for good reason, and hopefully this year he will have some consistent QB play so he can really shine. Analysis: Sanu might be the most versatile player in the country and that gives him incredible value in my eyes. If you haven’t seen him play you really should make an effort to watch him. He had 44 catches, 418 yards and 2 TD’s receiving, 309 yards and 4 TD’s rushing (5.24 ypc average), he was 6/9 for 160 yards and 3 TD’s passing, and he even recorded an interception on the season somehow (don’t ask me how he did it, I don’t know). Now that Randall Cobb has moved on to the NFL I think Sanu is hands down the most versatile player in the nation at this level, and that will intrigue a lot of talent evaluators as the season progresses. Analysis: Fuller shocked me with his performance against Patrick Peterson in the bowl game. He routinely worked him on come-backs and underneath passes and had over 100 yards against him while being matched up with him quite often from what I remember. Fuller is an imposing receiver because of his size and leaping ability, plus he has great hands. He will be a very dangerous red zone threat in the NFL, and he strikes me as a very effective possession receiver. 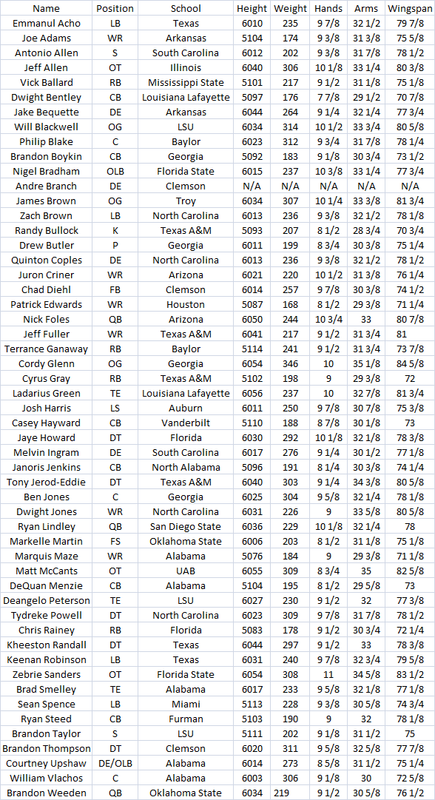 Analysis: Broyles could be higher on this list if I was not as worried about his hands as I am currently. He is very productive for Oklahoma but he body catches more than I might like, but he has the potential to be one of the best slot receivers in this entire class. I really like watching him play, I just want to see him catch the ball better away from his body more consistently this season. Analysis: I am high on Criner and I love his potential as a possession/red zone receiver. He has good size and leaping ability and really attacks the ball in the air and from what I have seen he has good hands. I am really looking forward to watching him more this season. I actually like him much better than I like Nick Foles, the guy throwing Criner the ball. Analysis: Childs wasn’t healthy for the entire season last year so his numbers were down, but I think a strong senior campaign can help improve his draft stock again. He’s not a flashy guy and he won’t fly by you on a streak pattern very often, but he has long arms, good leaping ability and reliable hands, plus he makes plays when you need them from what I have seen and for those of you who read my blog consistently you know that I value that quite a bit when evaluating prospects. Analysis: Jones had a very impressive sophomore campaign last year and while Yates is gone I am hoping that he will still play well this year as a junior. I’m not sure if he will end up declaring or not, but if he has another year like he did last year in spite of Yates leaving I could see it happening. He has a great combination of size and speed and is a very legitimate deep threat, I just need to watch him as a talent evaluator, not as a North Carolina fan (which I am) because I don’t want to overrate him because I have seen him play enough. I also am not always paying attention to how good his hands are, etc. when I am watching the Heels for fun. Analysis: Maze has made some impressive catches for ‘Bama in the time that I have watched him and I love his potential in the slot, so I put him in my top 10 even though I may be in the minority in thinking he is one of the top 10 receivers in the country at this point. He has shown me enough when catching the ball away from his body when I have seen him to have confidence in him even with McElroy, Ingram and Julio leaving. I don’t know if he will blow up for a 60+ catch, 1,000 yard, 8+ TD season, but I expect him to blow his numbers out of the water from last season. Analysis: Floyd has a lot of ability and he attacks the ball in the air which I love, but he does not run good routes and is definitely not a burner. I have also heard that he is very much a prima donna and doesn’t have a very good attitude, and that makes me question his ability to improve when he gets to the NFL. He has the talent, I’ve known that since he terrorized Minnesota high schools back in the day, but if the rumors I’ve heard about his attitude and mindset are true then he is going to scare off a lot of teams between that and his off-field issues this past offseason. There is plenty of talent that I left out, but I like the guys I have in this top 10 for the most part. Michael Floyd almost fell out of my top 10 but I think he has a good shot to go in the first three or four rounds if he is able to play for Notre Dame this season. If he doesn’t then he is going to drop like a rock on my rankings to be sure. Guys like Cobi Hamilton, Jheranie Boyd, Tavarres King and Russell Shephard all have the potential to be in the top 10 mix, as does Jarrett Boykin, but I would like to see more out of them before I put them in my top 10 rankings. Some might be surprised at how high I have Marquis Maze but he impressed me last year playing in Julio’s shadow and made some impressive catches with his hands, not up against his body. I really like his potential as a slot receiver in the NFL for that reason. Hopefully you enjoyed my early 2012 WR rankings! My TE and OT rankings will be up later this week, so look out for those. Thanks for reading as I try to start churning out content a little more consistently!